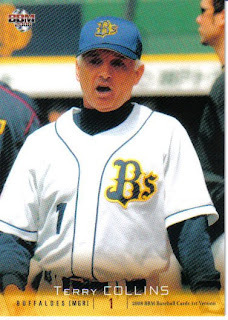 Terry Collins resigned last week as manager of the Orix Buffaloes. There's some interesting discussion about this over here at japanesebaseball.com. The consensus appears to be that Orix is run by idiots and it's no surprise that Collins quit. Ohishi Daijiro has been named his replacement. 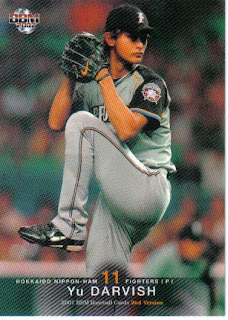 I'd post a card of him, but I can find no indication that he's ever played professional baseball, let alone had a card. Kita was the Marines' first pick in the 2002 draft. 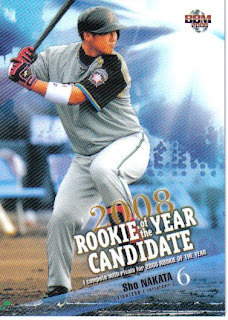 According to his player page at japanesebaseball.com, he only played 50 or so games for the big league club in 2002 and 2003, then apparently played for the ni-gun Marines until 2006. Don't know what happened to him, but he certainly looks happy in this picture. 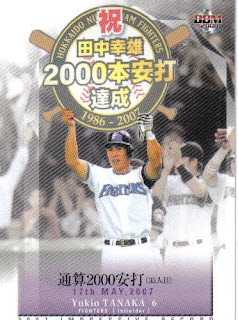 Calbee's web site now has the checklist up for the 2008 Series 2 set. There doesn't appear to be a release date associated with it but I would guess it would be out soon. BBM's website is now announcing a new set commemorating the 30th anniversary of the Seibu corporation acquiring the Lions. It's a pack-based set (as opposed to a box set) with cards for both current and former Lions players. 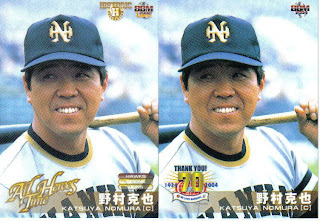 The website shows a Kazuo Matsui autographed insert card. 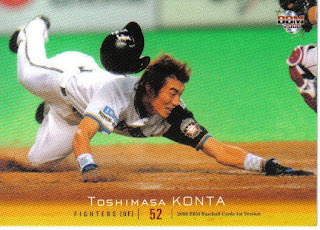 I don't know if that means that he or other former Lions now playing in the US (like Daisuke Matsuzaka) are in the set or not. I've always been a sucker for these sets (sometimes more sucker than I'd like), so I'll have to see if I can at least get a couple packs, if not the entire set. 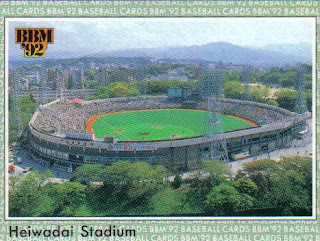 Here's a card showing Heiwada Stadium from the 1992 BBM set. 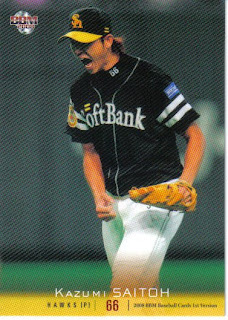 After the Lions left, the stadium didn't have a permament resident until the Hawks moved from Osaka to Fukuoka after the 1988 season (when Daiei bought them from Nankai). 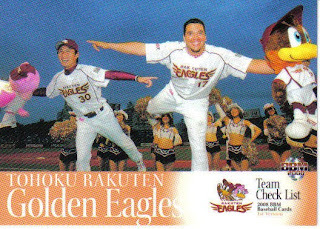 It was home to the Hawks until the Fukuoka Dome opened in 1993. I'm not sure if it's still standing or not. Update: I forgot to mention a couple things. The first is that the set should be out in late May, according to the web site. 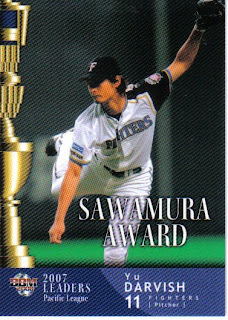 The other thing is that this is actually the second BBM set that commemorates Seibu buying the Lions. The first was a box set that came out in 1999 to celebrate the 20th Anniversary. 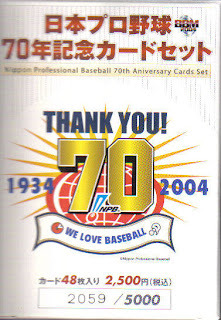 In 2004, Nippon Professional Baseball celebrated it's 70th Anniversary. To commemorate this, BBM put out a 48 card box set. Since I love historic sets, I picked it up, expecting it to be fun. It absolutely sucked. I noticed the first problem with the set the moment I opened up the box. 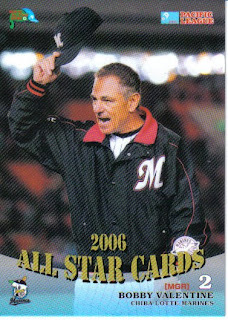 The card design was very similar to the design of the 2002 BBM All Time Heroes set. As I looked through the cards I realized that not only was the design similar, it was the same photos for almost every card! 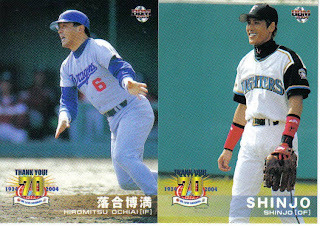 The only two cards that were different were those for Hiromitsu Ochiai and Tsuyoshi Shinjyo. Obviously, the card on the left is from the All Time Heroes set, the one on the right is from the 70th Anniversary set. The backs only differ by copyright line and card number. The second problem became quickly apparent when I organized the set and got a good look at who was in it. The set contained four cards for each of the 12 teams - two current players and two retired (OB) players. If the current manager of the team had played for the team, he would be one of the OB players. This means that Tsuneo Horiuchi (Giants), Akinobu Okada (Tigers) and Daisuke Yamashita (Baystars) got cards at the expense of other, more deserving players (although I can't knock the inclusion of Koji Yamamoto for the Carp, Tsutomu Wakamatsu for the Swallows or Ochiai for the Dragons). 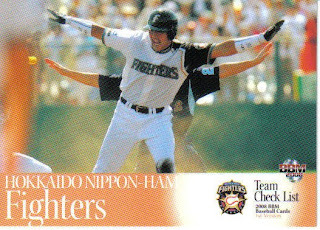 (This is actually why Ochiai has a "new" card - his All Time Heroes card was with the Orions.) 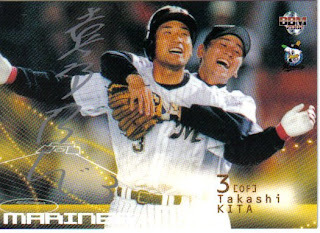 No active player who switched teams since 2002 was included other than Shinjyo - so the Tigers get represented by Norihiro Akahoshi and Akihiro Yano, but not Tomoaki Kanemoto. So the next issue isn't who's in the set, but who's not. 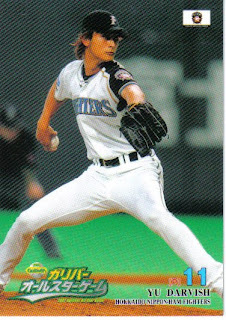 Masaichi Kaneda, winningest pitcher in NPB history, is not in the set. Tetsuharu Kawakami is not in the set. 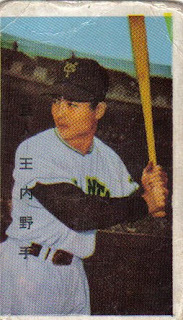 Eiji Sawamura is not in the set (in fact, I don't think anyone who played before the '50's is in the set. But there's one omission that just trumps all the rest. 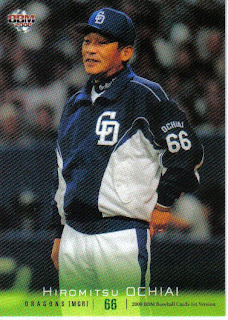 Remember that Tsuneo Horiuchi had to be one of the Giants OB cards because he was their manager in 2004. It should be no surprise that Shigeo Nagashima is the other OB Giant. So who does that leave out? 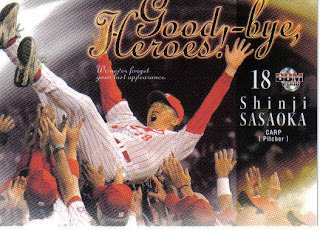 There's no Sadaharu Oh card in the set. 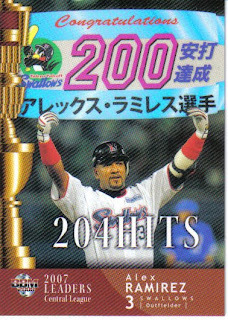 In a set that celebrates 70 years of professional baseball in Japan, BBM could not find room for the guy who hit the most home runs in the world. 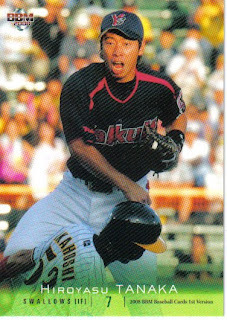 The guy who is arguably the most famous Japanese player in history (OK, at least outside of Japan, where it's Nagashima). Now, BBM has done some designs that I haven't liked, and their card decollation has almost always sucked, but this is the first time where I felt that they were actively trying to rip me off. So as a public service, I'm including scans of the two "new" cards so if you already have the All Time Heroes set (which is a great set), you can skip this one. Actually, even if you don't have the All Time Greats set, skip this one. It has to be the biggest waste of money I've ever spent on Japanese cards. 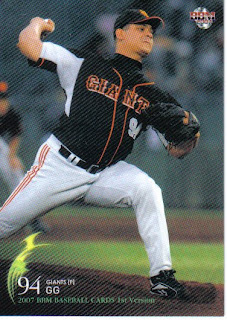 There has been much buzz recently about the possibility of Hokkaido Nippon Ham Fighters pitcher Yu Darvish being posted at some point in the near future. This past week, there was an article about Darvish written by Jim Caple on Espn.com along with something on the "Outside The Lines" TV show. I don't really know how likely it is that the Fighters would post him - under the current system, he wouldn't become a free agent for another 5-6 years and it's not like the Fighters aren't contenders. On the other hand, the Fighters would make a boatload of money. 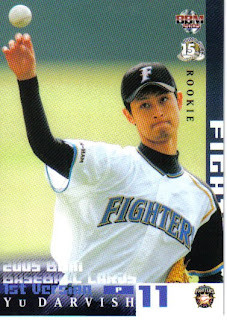 Of course, Darvish ultimately is the one to make the decision - the Fighters can't post him unless he wants to go. There's been some discussion about this by people who have much more insight than I do in a couple threads over at japanesebaseball.com - here and more recently here. 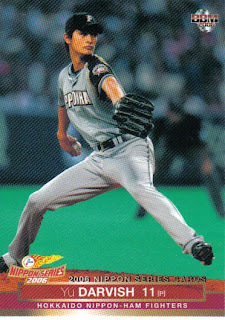 While I would tend to defer to their arguments, I also remember at least one member of that community pooh-poohing a report in Baseball America in 2003 that Kenji Johjima was considering leaving Japan as a free agent following the 2005 season in this thread. From top to bottom, that's 2005 BBM 1st Version #116, 2006 BBM Nippon Series #S02, 2007 BBM All Stars #A07, 2007 BBM 2nd Version #503 and 2008 BBM 1st Version #461. Bobby Valentine turns 58 on Tuesday. The hand collated set that I bought doesn't contain any insert cards. 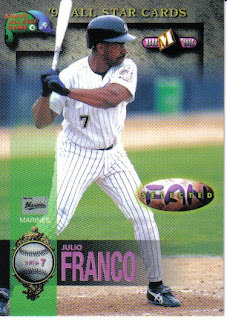 It looks like the insert cards feature the Best 9 and Golden Glove winners, which is pretty much standard operating procedure for BBM.